Los Angeles lawmakers have wrestled for years with how to legalize and regulate the vendors who sell food and goods on the city’s sidewalks. Now a state legislator is championing a bill that could take some of those decisions out of the city’s hands. Under a proposal from Sen. Ricardo Lara (D-Bell Gardens), California cities would not be able to regulate or ban vendors unless they have a licensing system that meets several requirements. And they could not require vendors to get permission from the brick-and-mortar shops next door — an idea that L.A. lawmakers have been weighing as they try to hammer out city regulations. The proposed law would, in effect, clear the way for sidewalk vendors in any California city that does not have a licensing system. That means that if Los Angeles continues to drag its feet on passing new regulations, it could be overridden by the state rules. Los Angeles stripped away criminal penalties for many vending violations last year, aiming to protect immigrant vendors after President Trump took office. But the city has yet to approve a licensing system, more than four years after Councilmen Jose Huizar and Curren Price first proposed that L.A. legalize vending. As the City Council has grappled with how to regulate sidewalk sellers, vendors are still being fined for violating the municipal code. “I question the will of the … cities to actually do something about this issue,” Lara told reporters, when asked why the state should step in and override local lawmakers. “It’s not fair to say, ‘We’re going to create a process, we’re going to decriminalize it,’ but yet not move,” he added. Beyond Los Angeles, the bill would also allow vending in California cities that have never considered permitting it at all. 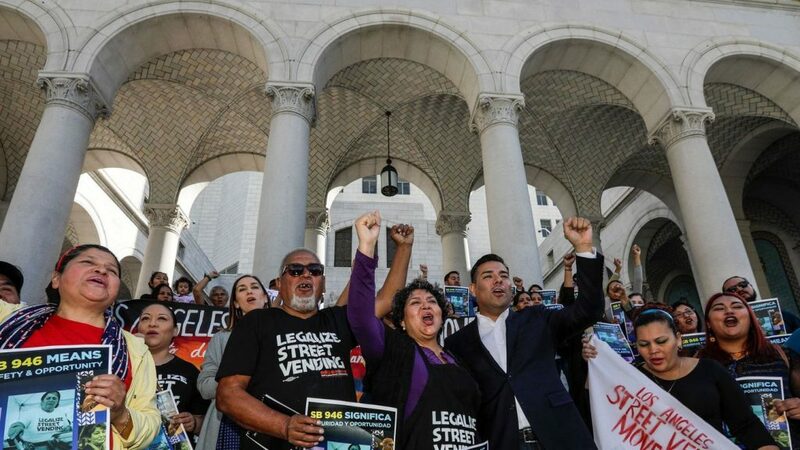 The proposed law, SB 946, would also insist on administrative fines for vendors who break local rules, rather than criminal charges that could ramp up the risk of deportation for immigrant vendors. At a news conference Friday on the steps of Los Angeles City Hall, Rosalva Flores lamented that her cousin Marcelina Rios was in an immigration detention center, separated from her children, after being cited for vending in Rancho Cucamonga. Rios was charged with a misdemeanor after repeated citations before being taken into federal custody, according to the Inland Valley Daily Bulletin. “Her only crime is selling corn,” Flores said in Spanish. Lara said he hoped the bill would spur Los Angeles and other cities to start licensing vendors in a “reasonable” manner. “The fact is that these sidewalk vendors are here. You can’t deny that they exist. You can’t deny that there’s a demand for them .… We want to make sure they can operate,” the senator said in an interview. In Los Angeles, brick-and-mortar businesses have been worried about how legalizing vending will affect them, raising concerns about trash, blocked walkways and what they see as unfair competition from vendors. Buscaino has backed the idea of requiring vendors to get permission from neighboring properties in order to avoid “antagonistic relationships,” Gleason said. “Lara should devote his attention to issues that affect the state as a whole and not attempt to micromanage local concerns,” said David DeVoss, one of the group’s directors. Lara countered that his bill sets parameters around local regulations, but cities would still have flexibility to craft their own rules based on health and safety concerns. Representatives for several other L.A. council members said they were still reviewing the bill. “We normally don’t like state legislation that restricts what we can do, but in this case, it might be good to have a state standard,” said Rick Coca, spokesman for Huizar, who has publicly pushed to legalize vending in Los Angeles. It is unclear what would happen under the proposed law to cities that already have licensing rules that require vendors to get permission from businesses. Lara was unable to clarify this week whether the state law would force such cities to toss out all of their vending regulations or simply override the conflicting sections.